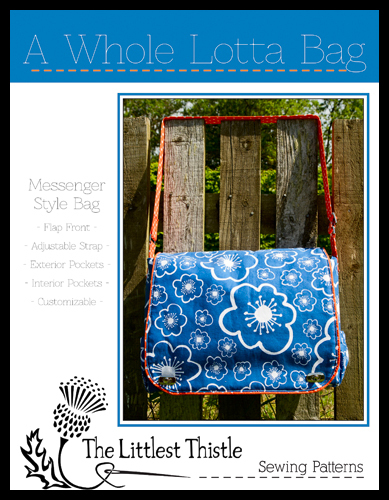 As a little incentive for those of you thinking of taking part in the Whole Lotta Bag Sew Along in the new year, how would you like to win a copy of the pattern and the metal hardware to go along with it? For a chance to win, please leave me a comment stating who you want to make the bag for, what fabrics you’d like to use and whether you’d prefer twist locks or snaps. Anyone that skips this part, will be skipped over in the draw, you have been warned! The giveaway closes on Monday the 9th December at midnight GMT, and the winner will be announced on Tuesday 10th December. Please ensure that your entry is either linked to an account with your e-mail address, or you leave it in the comment box in the format: name (at) mail host (dot) com. If I can’t contact you, you won’t be winning either, sorry! Lovely bag, which I would like to make for me – is that bad? :-) – and I would like to try velveteen with magnetic snaps. Thank you! I'd like to make a bag for me, in the new Charley Harper fabrics and as I've never used one, I'd love to try a twist lock! Ooo I'd make it for me and I think I already know which fabrics… I've got a red batik with hearts on it that I've been hoarding for a few years…. I think I'd give twist locks a go as I've never used them before. I have a several nieces who would love this bag so I'd have to make 5 of them. I've got fabrics in my stash that fit their personalities. I'd love to try the twist locks as I've never used them. Thanks for the chance. I would make your lovely bag for myself out of corduroy with an AMH feathers fabric lining. Preferably with magnetic closures. Thanks for this opportunity Katy! I confess that I would probably make the bag for myself. I would love to try the twist lock closures. As for fabrics, I've got a heavier Ikea wood print that would be perfect. I'd like to make the bag for my friend Ginevra who is having her first baby in April. Much like the one you did for Sarah, I'd use a laminate in the interior and a quilt as you go collage for the external fabric using my stash of Sarah Watts Timber and Lodge fabric which I have been hoarding until now .If I don't win I'll have to make it anyway in the quiltalong though I hope you are going to give lots of support as I have not made a bag before. I'm chicken! I would make the bag for my oldest daughter who is a traveling nurse, it would be great for her to tote all her stuff in! I would use some Nurse(y) fabric I bought a couple of years ago that has a Purple background.I think she would like the twist locks the best. It would be for me I think. I would use a heavy cotton fabric from Ikea. I love their fabrics for bags and they are so cheap. I would like to try a twist lock. Thank you. jennylarking at gmail dot com. I'd like to make it for me (sorry!) in a black and white tweedy fabric that is sitting in my stash crying to be a bag – and I'd make it with magnetic closures – I'd also like to make it with a really bright and surprising lining fabric! I would be very altruistic and make it for my daughter with the Tula Pink fabric with the fox head, (Acacia I think igt is called) the pink colour version. I would probably try the twist lock. Would love to make this pattern. As an avid Disney Mickey Mouse fan, I have the perfect Mickey Mouse fabric for this. I would like snaps. I would actually make this for me to use as a diaper bag when caring for my two grandchildren. I never make anything for me!! Would love to make it for my daughter-in-law who has temporarily moved in with us which must be a trial for her, but she has done it with the utmost grace! I have some lovely tweed fabric that would be right up her street too, and twist locks would be the way to go too. I would love to make one for my husband! I would use some canvas because I have wanted to try waxing canvas and this would be a great opportunity. I have always loved magnetic snaps. I would make the bag for myself. With some light weight home decor weight fabric I have stashed away. I would love to try the twist locks. I would like to make it for my daughter. She loves grey, so I'm thinking some Glimma in slate from my stash. And she doesn't like magnet closures, so twist locks it is. Thanks for the chance to win the essentials. I would make the bag for me and I am hoping that it might be perfect for my camera too. I would love the magnetic snaps please. Fabrics are harder, I have some nice newish Japanese linens or maybe some of the AMH feathers in linen, or maybe using comma, maybe I need to make more than one bag? so kind of you, this wonderful Giveaway! I would make this bag for my daughter – this is just the sort of bag that she loves ( me too but I suppose it's lucky that I love her dearly!). Thanks for the chance to win. I would make the bag for my daughter in her favourite colour blue with a heavy cotton. I would choose the twist locks.Thank you for the chance to win. I love the branding on your pattern! I think I'd make it for me in needlecord (probably the lipstick 21 wale from Village Haberdashery) with a dotty lining/piping, not sure of the colour of that, though but very sure about the dots! (And I'm fairly certain that once she's seen it I'll end up making one for my mam, too!) 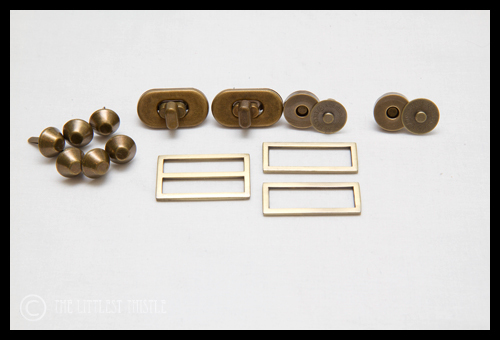 I'd like the twist fasteners because I've not used those before. I would make this in bright, modern fabrics for my daughter-in-law. She will soon have her hands full (with baby expected in April), so a hands free bag would be very useful! I think the snaps would be the most practical. I would like to try this bag for myself. Most of this hardware I have never used before. I have some Amy Butler fabric I would like to use. I prefer twist only because I have never tried those before. Thx for this giveaway! I would make this bag for either my daughter or my son's girlfriend or both, lol!!! For my daughter I would use blue and brown fabrics because she likes those 2 colors and I would have to ask my son what colors/prints his girlfriend likes. I would choose the twist locks only because I have never made anything with them before and would like to try the twist locks on a bag. Maria of Mia's Creations sent me over here. I am going to browse around your blog next. Thanks for a lovely giveaway. What a great idea for a giveaway – just add fabric! I think I'd make this is Liberty cord, but then I'd find it very difficult to give it to anyone and so it would end up being for me. Twist locks would be my choice of fastener. I love this pattern. I would make it for myself in a red & white chevron fabric. I have never used the twist locks so it would be a great time to use them. I would like to make this bag for my daughter in canvas (maybe Charley Harper?) using magnetic snaps! I just love your bags & although I cannot stop making them (I have an addiction for making bags) I have never made a Messenger bag cause I have never found the pattern which makes up to my satisfaction. I have been fortunate to be able to test a few bags for Sara Lawson and have been greatly humbled by her enthusiasm for them. i would make the bag for me and i would use Lotta's canvas from glimma (which i have stashed just waiting…)i think i'd go for snaps but i can't decide! thanks! If I won this pattern, I would make a bag for me. I would like to use a twist locks because it would be my first experience using this type of closure. As for the fabric that I would liketo use …….mmmm I think it would use denim. Thanks for hosting this giveaway!!! I found your blog through Maria's Creations. I'd love to make this for myself (I'm still using the freebie boots nappy bag as I haven't seen another that I love enough to pay an arm and a leg for!). I'm thinking I'd make it for me as a laptop bag, if it's big enough? I've got the perfect natural linen at home with coloured dots on it. I'm afraid I have no idea who made it. I'd like to try a twist lock as I've never used one! If it's not big enough for a laptop bag then I'd most likely make it for my mum, again with the a twist lock, but which fabric? It would have to be Amy Butler as that's her favourite but I'm not sure what I've got…. I'd be making it for meeeee, Fabrics-wise I'll probably use some of the yardage I bought in the black friday sales, I buy some fabrics in bulk knowing I want it for future bag making or dressmaking rather than patchwork. I can't remember what I've ordered now though that I'm on the spot! I think I'd prefer twist locks please, for a change.